Professor Saul Cohen is University Professor Emeritus at Hunter College and the City University of New York. He is also Editor of the Oxford World Atlas, among other positions. Professor Cohen obtained his PhD at Harvard University and is specialised in geopolitical theory and political geography. He has written extensively about political and economic geography, Israel and Middle East geography, education and environmental perception. 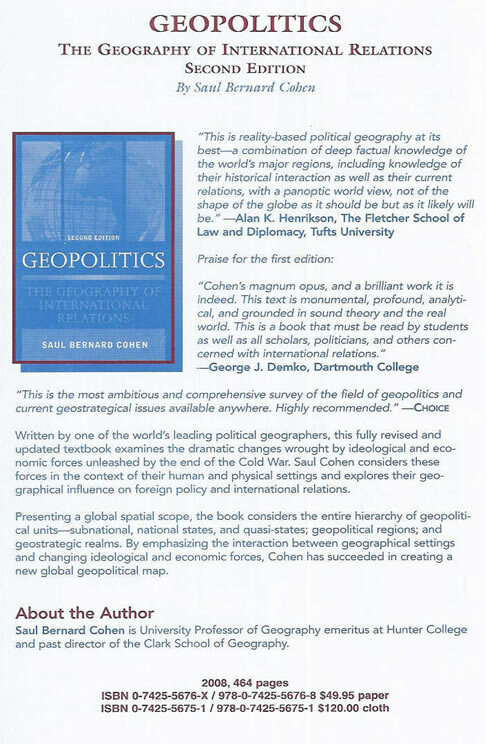 In 2008, the second edition of his book “Geopolitics: the Geography of International Relations” was published. At what age did you discover geopolitics and what attracted you to it? As an undergraduate student at Harvard, I took courses in Political Geography with Derwent Whittlesey. What impressed me most was the depth of his classic volume, The Earth and the State, which was an example of applied Political Geography in which the role of the region, at all levels and all scales, combined with the natural and human landscapes, influenced political relationships and outcomes. I continued my work with Whittlesey as a graduate student. I was also influenced by the work of Stephen B. Jones, particularly his “unified field theory” of Political Geography, and by Jean Gottmann’s approach to Political Geography through analysis of the circulation of peoples, goods and ideas. Which geopolitical topics have you focussed on and why did you choose especially these? Over the years I have focused on the reordering of the world system in terms of its geostrategic regions and geopolitical subdivisions. In this context, those parts of the world which are internally fragmented and also caught up in Great Power struggles, became Shatterbelts and surrogates for conflicts, which involved the Great Powers indirectly. The Middle East and Africa in particular, have been persistent Shatterbelts. As Great Powers become mutually dependent, the possibility of Shatterbelts to mutate to Gateways increase, as in the case of the Eurasian Conversion Zone and Eastern Europe. These are topics of vital interest to conflict resolution. What do you consider your most important contribution to geopolitics? I consider my most important contribution to geopolitics to be the blending of world regional geography, political geography and international relations. I have used developmental theory to trace the evolution of the world system from its earliest state of atomization through differentiation, specialization and specialized integration. With respect to the major powers of the world, the system is now intermediate between the latter two, enhancing the prospects of peace among those powers, and including ascending regional powers such as Brazil and India. However, the world system has become two-tiered, as Shatterbelts have spread into western Latin America, Afghanistan and Pakistan, and throughout Africa. The challenge the major powers face is to preserve their national interests in these regions while working together to address those factors that encourage guerilla warfare and other forms of atomization. What is your favourite definition of geopolitics? I define geopolitics as the interaction between geographical settings and perspectives, and political processes. The settings are composed of geographic features and patterns and multi-layered regions that they form. The political processes include forces that operate at the international level and those on the domestic scene that influence international behavior. Which geopolitical scientist do you admire the most? My two heroes are Derwent Whttlesey and Halford Mackinder. What is your favourite geopolitical book? Moreover, Paul Kennedy’s “The Rise and Fall of the Great Powers” (Random House, 1987). What is your favourite geopolitical website? I use the U.S. State Dept. Facts on File to remain up-to-date on changes on the national level. In what direction(s) will geopolitical science be heading the coming decades? It will become increasingly cross-disciplinary, using geopolitical analysis to predict global trends. Which geopolitical subject has been too little in the spotlight and needs further research? The impact of global migration, climate change and the clash between nationalism and religion. What will be the largest geopolitical challenge for the world in the 21st century? The 21st will be the Global Century, not the American or Chinese. The complexity of the system requires the leadership of all the major and regional powers to keep the world in balance. As first among equals of the Great States, the U.S., in partnership with the E.U. will be challenged to apply its military and economic power to international affairs with wisdom and consistency, while mindful of the limitations, as well as the responsibilities inherent in the exercise of power.